It really begins to get colorful in April, May and June. Which is why I decided to post a month at a time. By the time April steps in, anticipation moves outdoors, thanks to planning and selection of early bloomers. One of my new acquisitions is a trio of primroses I planted in late summer 2015. 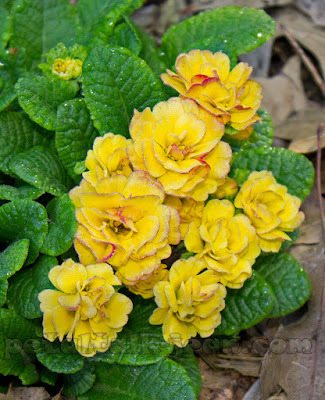 They are part of the Primula Belarina series named 'Nectarine', and their color is a luscious yellow/pink. The literature I've found indicates they are fragrant, but you'd have to go into belly crawl mode to detect it, because the plants are no more than 8" tall. I think I'll try some in containers so I can appreciate them up close. They now come in several colors, ranging from Cream to Cobalt. I've been adding to my collection of Hellebores over the years, and a few have lost their identity. Or, more accurately, I've lost their identities. 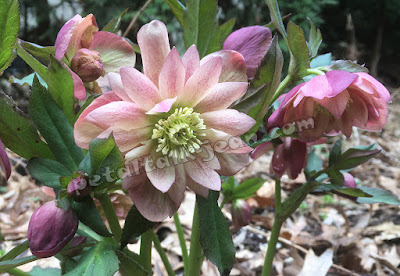 One of my favorites is a double, with darker pink outer petals and pale pink inner petals lightly splashed with the same shade as the outer petals. I love to combine Hellebores with pretty much everything, from Epimedium to ferns, creating colorful groundcovers in the mid-spring garden. 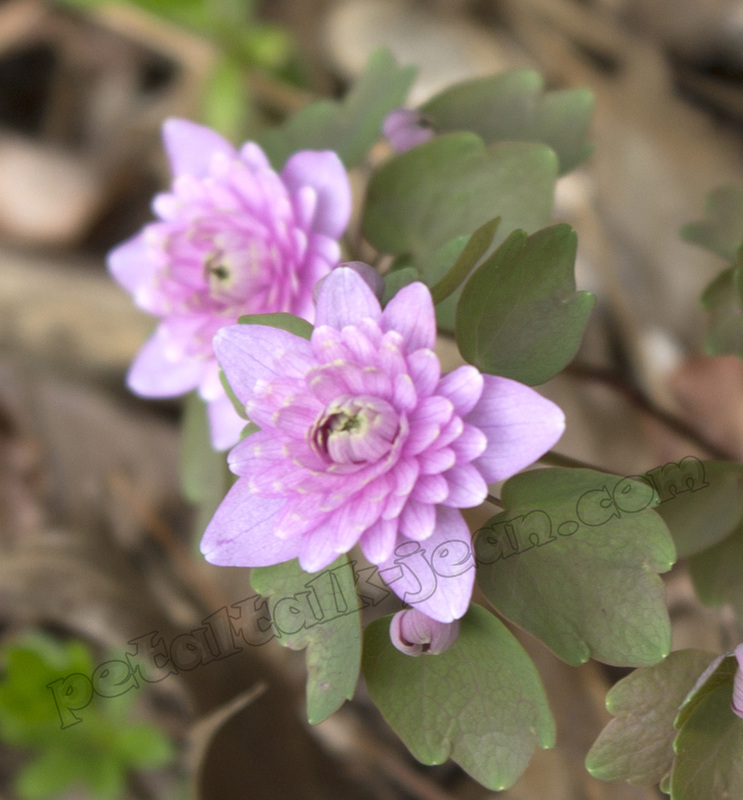 Another little flower that enjoys shade is Anemonella thalictroides 'Shoaf's Double'. I purchased just one plant several years ago, and it's finally tripled in size. Which isn't saying much considering it was in a 2" pot to begin with. They aren't cheap, and there were so many other plants at the nursery that were begging to come home with me. I had to prioritize and so I just bought one. When you do this, it can be hard to keep track of it because it might tend to be overshadowed by its neighbors. I kept its companions on the dainty size so it wouldn't be overwhelmed. I've noticed the first three flowers I mentioned all are doubles, meaning they have double (and sometimes more) the number of petals on its flowers. Some flowers look good as doubles, while others do not, but that's my own opinion. I don't seek out doubles over singles, especially in lilies, which I think look terrible as doubles--and that goes for both the day lily and the Lilium. 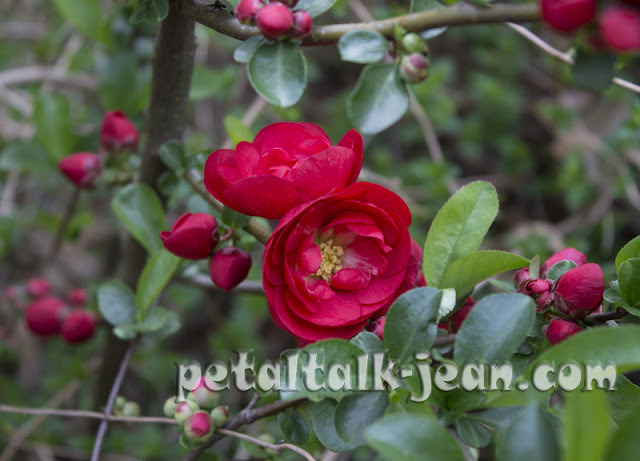 Double Take Scarlet Quince is great for early color, with its double-petaled bright red flowers. Aquilegia 'Winky Double Red-White' never fails to bring on a smile. And always plays host to some early-arriving bees. to its color--the better to mix with other early-bloomers. It's not good to have all the color at ground level, especially if you plan on viewing your garden stars through a window on a rainy day. Flowering quince 'Double Take Scarlet' is aptly named, as its presence is hard to miss. 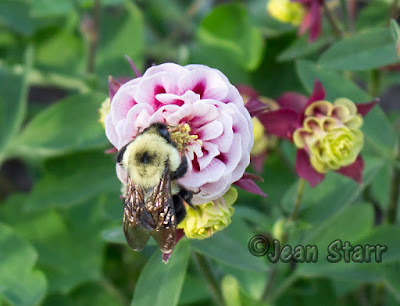 The shrub is around 4 feet tall by 3 feet wide, and blooms very early in the spring, so you'll have lots of branches to bring inside for a vase or to leave outside for you and your neighbors to enjoy. 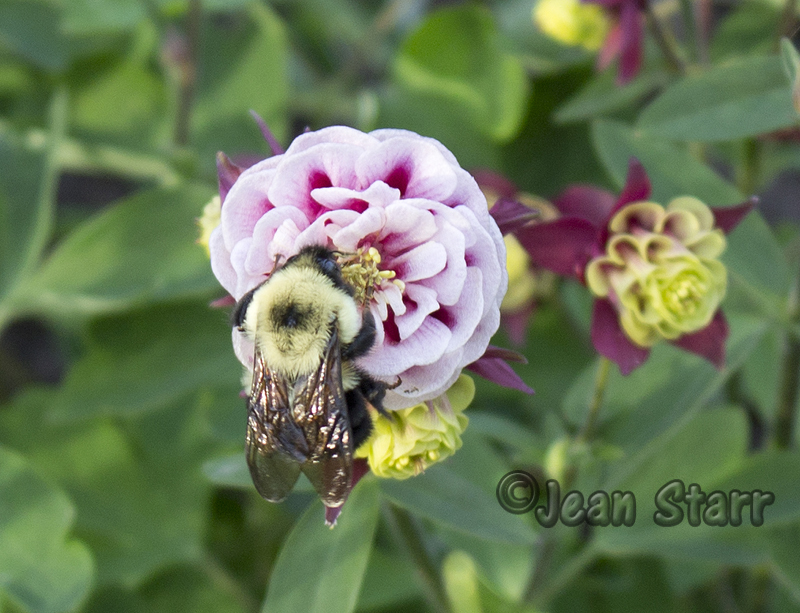 Sometimes called "granny's bonnet" because of its flower shape, Aquilegia, comes in double forms. I couldn't pass 'Winky Double Red-White' up at the garden center. It was just so darned cute! Growing to just about 18" tall, this little plant has kept its looks for three years so far. Aquilegia (commonly called columbine) isn't known for its longevity in the garden, but will often reseed, its offspring reverting back to the hybrid's parentage. One of the easiest perennials to grow for early season color is Geum, or avens. This rose relative grows a compact clump of green leaves, and suddenly sprouts flowers on top of 10" to 16" stems. It comes in colors in the yellow-red range and in single, semi-double and double-flowering types. Some garden centers will have stock plants in bloom in April. They're well worth the search. While most of the flowers blooming in my garden in April are perennials, and come back by themselves each year, some come from garden centers. Mid-April is not too early to shop for plants--even some annual flowers enjoy the unsettled spring weather. 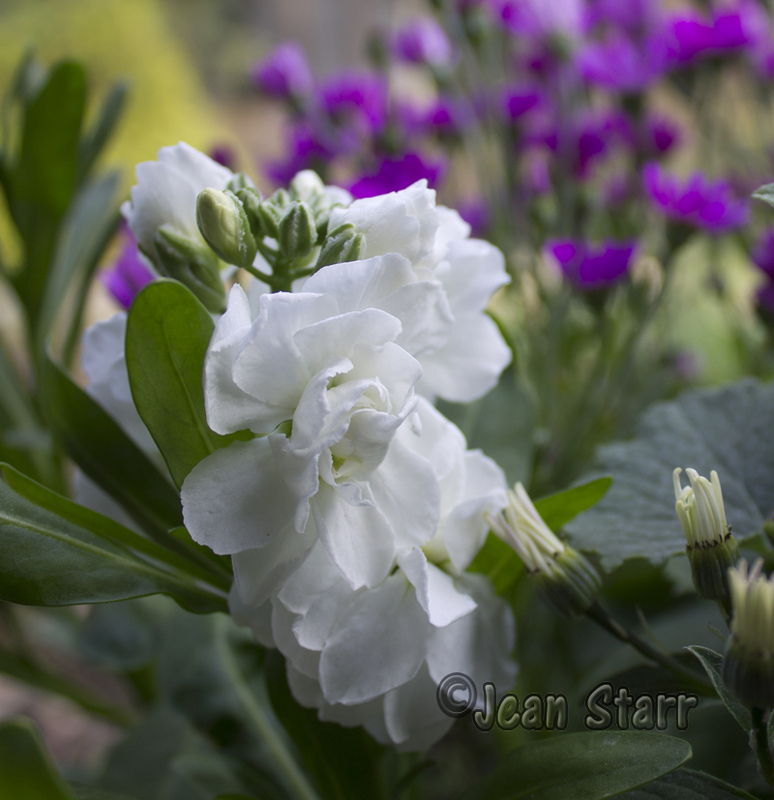 One of my favorites is stock or Matthiola. The most fragrant in my experience are the white double-flowered forms. Stock is usually available in flats, so you often end up with a mix. But if you make sure at least one out of four is a double white, you'll have the most heavenly fragrance to enjoy outdoors! Just seeing these pictures does get me buzzing.